Today I went for a run that I was looking forward to all day. I started running and it felt so great, my legs felt good and my breathing was great! But then all of the sudden, a little bit more than half way through my run I just wasn’t feelin it anymore. Something that I almost never do during my runs is walk. I feel like walking (for me) is defeat. But today it just felt so good to walk, so I kept on walking! I walked for about a mile at a fast pace to keep my heart rate up and it was so great! I walked for about a mile and then started jogging again. I didn’t have any pace or goals set for the run so walking didn’t mess anything up. As I was walking I was thinking that sometimes it’s nice to just slow things down and take it all in, things don’t always have to go fast paced and plans can be changed! 1. Does anybody else leave their race tags on their shoes? Well I do! It’s a nice reminder of my hard work when I am running 🙂 Anyway, today when I was at the grocery store waiting in line a fellow runner asked about my race tag and it started a whole conversation on races! It was really awesome! 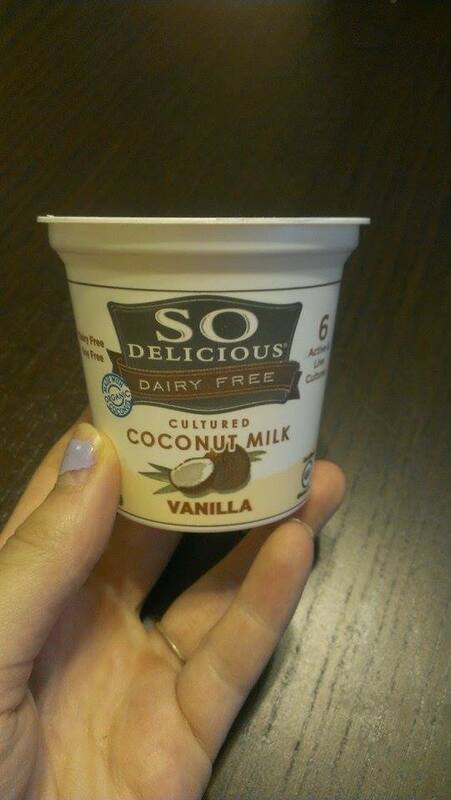 I don’t drink cow milk and thought that I would try this non-dairy yogurt. Consensus—SO GOOD! I will definitely buy it again. I usually prefer to eat yogurt that is higher in protein but this is good for a snack too! Tomorrow I’ve got a great shoulder workout planned along with some on the stairmonster…wish me luck. Have a great Monday tomorrow! It was so nice! And yes, I definitely recommend trying it out!! So yummy with berries in it too!